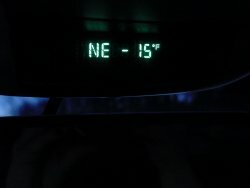 Well we’ve discovered that starting from 30 degrees below zero is one way to make ten above feel like a heat wave. While it’s not exactly balmy, at least it’s safe to go outside again (at least a little) and there are a few anglers moving around again. On the promise of a continued warming trend, we’ve got a busy week and weekend planned and with a little luck, there will be some more optimistic report coming in. Here’s a bit of what we have trickling in right now. One of the side effects of this cold snap has been an increase in the number and size of ice ridges forming especially on the larger lakes. Winnibigosh has two major ridges and several smaller branches to contend with. One of them runs out from roughly Tamarack Point West toward the North Shore. If you’re coming from Tamarack Bay and want to fish South of the ridge, you’ll have to head toward shore at Tamarack, cross there and then head back out on to the lake. The second major ridge is running East/West from the South end Westward toward Moses Bar. There’s a crossing near little stony that you’ll use to fish the Center Bar and mid lake areas. I don’t know where the crossing is on the West Side, so until I do, I’d suggest contacting McArdle's or Becker's Resorts to get a run down on the West Side. Don't try crossing those ridges right now! 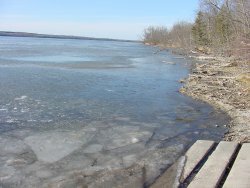 There is open water and at least two vehicles have had near misses this week. The Perch action on the big lake isn’t bad but according to my friend that’s conducting the creel census for the DNR, there’s a high percentage of smaller fish showing up in the bags right now. Occasional 10 inchers, with lots of 7 to 8 inch fish. The bottom line is that the action is fairly good, size is below average. We still have a couple of week’s worth of Walleye fishing and the reports have been consistent for the past few weeks. There are lots of smaller Walleye with an occasional keeper mixed in. The humps and mid lake bars have been fished heavily now and I think you’re better off looking for some new territory. Even though it’s still winter to us, fish will begin staging closer to shore soon. 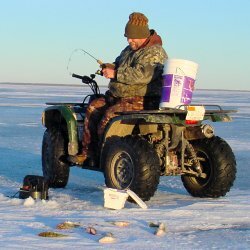 Ice fishing for Walleye during the late part of the season has generally been better along steeper drop off areas along the breakline in 16 to 24 feet of water. Early morning, late afternoon prime time bite is the best. Crappie fishing? Scouting for new territory is the way to go. A friend of mine who has fish house rentals has been able to keep his customers over some decent Crappie fishing this week. His secret has been to keep scouting even after he finds a decent school of fish. When you locate a "good hole", fish it for a day or two and then get out of there and find some fresh fish. I think that is really important because the fish you leave behind tend to stay in that area and re-group when they're left undisturbed for a while. You can go back in a couple of weeks and try them again. Like I said, reports are trickling in for now. Let's hope the predicted warm up arrives and we can get out and do some good scouting this week. If so, there will be some more solid information coming as we head into that magic March panfish bite. 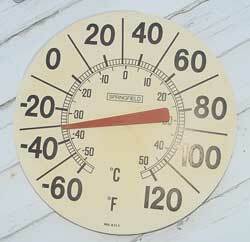 Here's another of many images from the deep freeze zone. The past couple of days we've had highs reaching back up to 10 or 12 above and a few anglers have gotten back out on the ice. Ice conditions right now in the Northland are about as favorable as you’re going to get. We’ve had a great week for ice making with very light wind, almost no snow cover and daytime highs staying just below freezing. Ice thickness varies somewhat from lake to lake, but we’ve been fishing the over deep water and finding 12 to 14 inches of good solid ice. In fact, I’m surprised that I haven’t seen some pickups running around on Lake Winnie already. I think a lot of folks are like me in that that don’t want to be the first one to drive out, but as soon as we see some other folks out there we’re gonna be right behind ‘em. Fishing continues to be decent. The really hot "pre Christmas" bite has slowed a little, but fishing action is consistent enough to keep most of us happy. 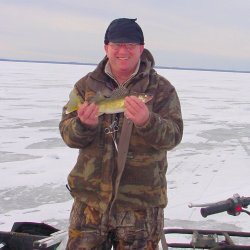 I’m usually an advocate of fishing Walleyes during "prime time" sunrise and sunset, but our last couple of trips out, it seems like the Walleye bite is actually more reliable at mid day. Yesterday, we didn’t get to the lake until about 1:30 PM and our first spot produced fish almost immediately, then just when you’d expect that later afternoon run to kick in, there was a minor spurt of small fish and then, game over. Whether it was just our spot or not is hard to know for sure, but I’ll be shooting for earlier start times this week just to test my theory. Walleye location (for us) has been right up on top of structure. If we find a main lake hump that tops out in the low 20-foot range (20 to 23 feet), we find the deeper edges and then drill holes from there back up onto the top. We’ve been moving from one hole to another trying to "cherry pick" the active fish. We’ve been watching our Vexilars and seeing lots of fish move up to the bait, sit there and wait for a couple of minutes before they finally bite. The only way that I’ve found to speed up the action has been to get my bait out of the hole for a minute, freshen up the bait and then drop it back down. If you don’t get hit in 30 seconds or so, move on to another hole. Jigging baits like the Forage Minnow or Swedish Pimple are still working, but I had some better action yesterday using the larger size Demons tipped with some really nice Emerald Shiners I got at Fred’s Bait. Hook the shiner in the center by running the hook along the backbone parallel to the dorsal fin. Get the bait about 12 inches off the bottom and let it sit still to trigger more of those finicky biters. Perch fishing is still up for grabs. We’re finding some nice Perch on some of the main lake humps, but certainly not all of them. Some folks are sticking with the shallow water and continue to have good action there too. No matter where you decide to look for them, the secret is apparently to find better schools of minnows. The more bait we see on our flashers. The more Perch have been in the area. Once you find them, jigging spoons, small jigging Rapalas and the Perch Eye imitators are all working equally well. I usually have a tidbit or two about Crappies. Initially we heard some good reports about the Crappie fishing, but once everyone started zeroing in on the Walleyes, the talk about Crappies kind of slacked off. I’m not fishing them either, so I don’t have any great stories to tell. I’ll keep my ear to the ground and see what I can dig up this week. The past week delivered a bit of a setback for ice fishing enthusiasts by dishing out some brutally nice days. Sunny and calm with daytime temperatures in the high 40 to low 50 degree range doesn’t exactly put the ice maker into high gear. In spite of the nice weather though, there are still several smaller lakes with a nice clear layer of skim ice and as of Sunday 11/26 a handful of the larger area lakes are skimmed over with some fairly good looking ice as well. As usual, the deeper lakes and lakes with lots of wind exposure are still open except some ice around the edges. 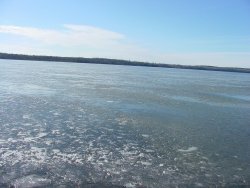 We checked the public landing at Jessie Lake on Saturday and found the lake frozen across most of its surface, but when we stepped out a few feet from shore the thin ice cracked and broke easily. The good news is that daytime temperatures just barely topped 30 degrees so ice will be forming steadily all night long. Every day without snow is a bonus now and with a few cold nights and barring any heavy rain or snow this week, it looks like we’ll have a decent base of ice to work with. 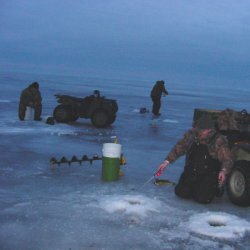 The forecast of falling temperatures and light precipitation ought to play right into the plan and those of you that are anxious to get into the Pike spearing season next week should have a least a few good spots to choose from. Stepping out a few feet from the landing revealed that the ice is far too thin for foot traffic just yet. But it's heading in the right direction. Sharpen the auger blades! 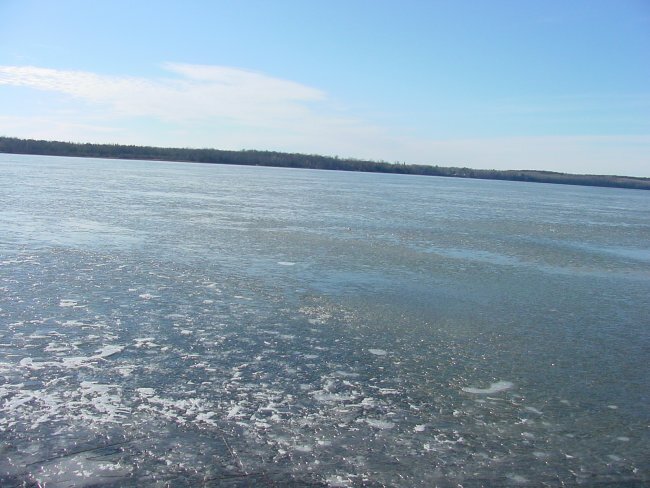 Jessie Lake located 15 miles North of Deer River had about an inch of ice cover across the entire lake on Saturday.